Expert System offers text analytics and cognitive computing software that through linguistic understanding and artificial intelligence algorithms understands the meaning of written language the way people do. Our software, Cogito, is different from traditional technologies that treat text as a sequence of characters (keywords) or through statistics-based or pure machine learning approaches. Traditional technologies don’t understand the meaning of words. We do Cogito powers a suite of products that help organizations create business value in knowledge management, customer experience management, operational risk mitigation and intelligence. At the core of every Cogito product is a full set of cognitive capabilities that empowers your ability to use the knowledge contained in large volumes of unstructured information that companies manage to gain strategic insight, support decision making, automate information intensive processes and mitigate operational risks. Discover is a knowledge management software that leverages its understanding of language to classify, extract and make available the information that matters in text content. Learn More about Cogito Discover. Cogito Intelligence Platform reveals insight and intelligence from any volume of unstructured content supporting analysts in every phase of their intelligence activities, in government or any industry. 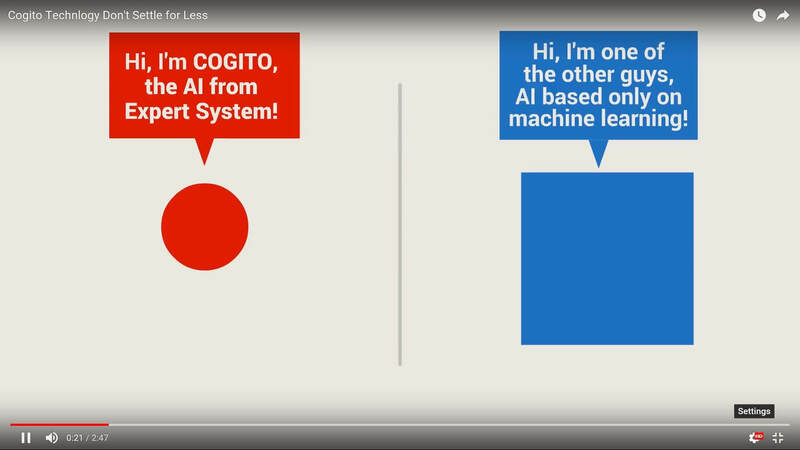 Learn more about Cogito Intelligence Platform. Cogito Answers is the Expert System semantic software that brings a complete semantic and linguistic understanding of content and inquiry to transform the customer experience. Learn more about Cogito Answers. Cogito for Claims is the Expert System software for the Insurance sector that automates claims processing by capturing and extracting the data that matters to optimize the time and expense of FTEs. Learn more about Cogito for Claims. Cogito for Underwriting is the Expert System software for the Insurance sector that automatically handles submissions, analyzes policies and compares them to avoid misalignment and automates assessment of property risk reports. Learn more about Cogito for Underwriting. Cogito Studio is a fully integrated environment for building and deploying custom semantic applications. Learn more about Cogito Studio. Biopharma Navigator explores the biopharma and healthcare data landscape through a user-friendly analytics visualization interface, finding the answers you’re looking for in a few clicks. Learn more about Biopharma Navigator. Cogito API is a suite of semantic features and tools available for developers in a fully documented REST API Interface. Learn more about Cogito API.